From another time and from another world, Galatea Future arrived in the world of the Champions to do the one thing she tried so desperately to avoid before… to live. It’s been a year since Galatea Future left the public eye. What has happened since then? And what will bring her back? Ronin Omega investigates the death of Foreclosure, but he’s not the only one to do so as UNTIL sends in their own special agent. Plus, we are introduced to Starlett. What happens when Galatea Future faces an enemy that she cannot fight? While Galatea Future races to save the life of Mayor Biselle, Starlett steps up to confront a hitman sent to kill the otherworld guardian. It’s Hunter versus the Hunted… but which one is which? The stress of the hunt affects both Galatea Future and her best friend, and she realizes she cannot do this by herself! Following the events of the previous issue, questions are raised about Galatea’s actions and her origins. But while she tries to deal with that problem, a new figure appears in Millennium City with a mission. Can the city survive the arrival of THE NATIONALIST? “Psilence of Conscience” Begins Here! As Athena Rose Fairmore’s latest book is about to be released, Galatea Future discovers that The Nationalist has cemented his place in Millennium City with the help of some influential friends. What will the otherworld guardian do when the “passionate crusader” starts to focus his attention on Galatea’s friends and acquaintances? “Psilence of Conscience” Continues! It’s Galatea Future versus The Nationalist! Who will win? Plus, what is happening to one of Galatea’s friends? “Psilence of Conscience” Continues! A very familiar-looking hero has arrived in Millennium City looking for Galatea Future. But is she who she thinks she is? And if so, why does she know something about Galatea Future that nobody else knows? “Psilence of Conscience” Continues! Galatea Future is looking for Candace Sinclair, but she isn’t the only one. Galatea is also looking for the woman claiming to be Psyche, and she also isn’t the only one. Will anyone find whom they’re looking for? “Psilence of Conscience” Continues! Look out Millennium City! Malizia is out and about and ready to remake the city. It all comes to a head in this hyper-sized conclusion of the “Psilence of Conscience” storyline! Following what was the worst day in her re-purposed life in the world of the Champions, Galatea Future eagerly accepts a new mission that takes her out to the radioactive area known as “Burning Sands”. Meanwhile, Starlett is struggling to settle in with the changes to her life. However, Markman Gold is seeking to use what he knows to get vindication. Following the events of Issue #13, Galatea finds herself in a strange place and in a strange life. Where is she is a surprise. What happens next will shock you. Find out how it ties in with the recent events in “The Crucible”, and be prepared for a most unexpected cameo appearance. 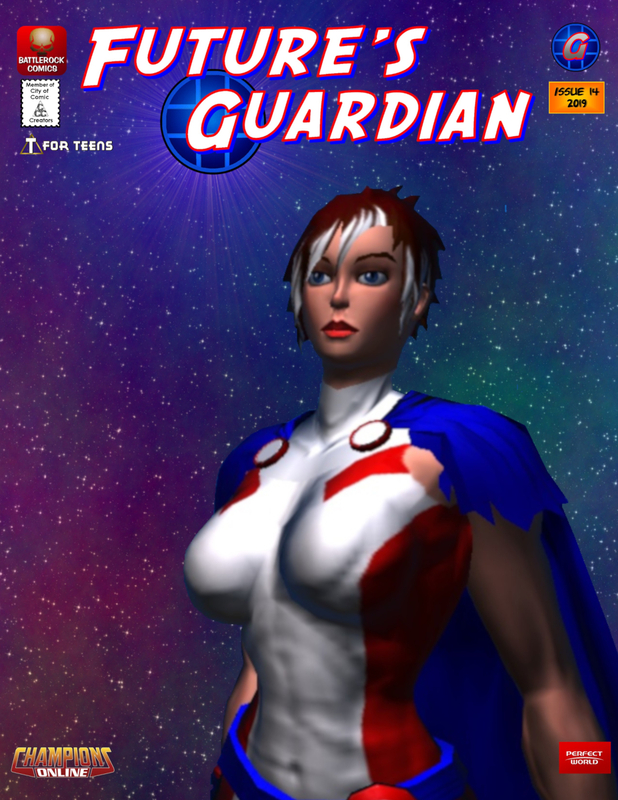 Future’s Guardian is created using original characters in the Champions Online Multiplayer Online Roleplaying Game. Copyright © 2014, Perfect World Entertainment, Inc. 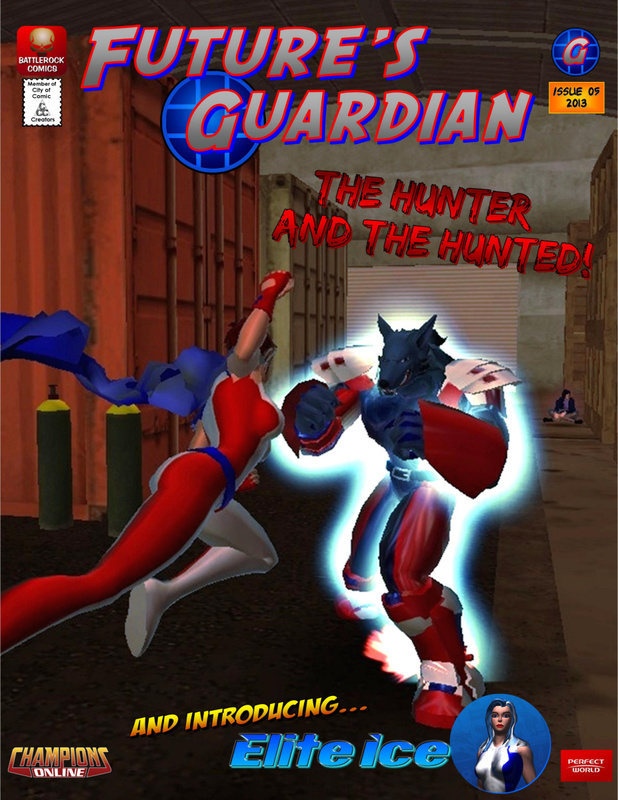 This comic series is an independent not-for-profit derivative work of the Champions Online Game. All original rights are reserved by Cryptic Studios and Perfect World Entertainment Inc.. Cryptic Studios is a trademark of Cryptic Studios, Inc. Perfect World Entertainment is a trademark of Perfect World Entertainment Inc. All other trademarks are property of their respective owners. Battlerock Comics is a subsidiary of Get Brutal Productions. Neither Battlerock Comics nor Get Brutal Productions make any claim on the content owned by the above-mentioned companies. Good to see you’re carrying on with the comics ‘Rock and that the CCC is still around. Didn’t realise MMO Comic Index was around because there was no update on the old Index site and the Facebook group can’t be viewed without and account. Thanks! We kept the MMO Comic Index quiet until recently because it wasn’t really configured yet for registration and it still needed logos. Ra and myself have been adding both new and old material. It’s still a work-in-progress, but getting there. Hopefully we’ll also have the forums set up as well. Thanks also for the new logos. They look good! Thoroughly impressed! I wish I could help. If there’s anything I can do to help, please send me an email! I’d be glad to just edit your text for you! Good job on this! Just found my way here and started reading #1. Very cool start, and well done too.